Kitsune is a 15 year old who attends Kin Private Boys Academy. He's got black hair and black eyes. He's a trickster and a prankster and he's not one to have any friends at all. (In fact, Kato-chan and Kone-chan agree that he's a jerk.., and so do I.) Like I said, he's no peach. Meanwhile, he's totally different when it comes to being around his girlfriend, Dokuno Kasumi. 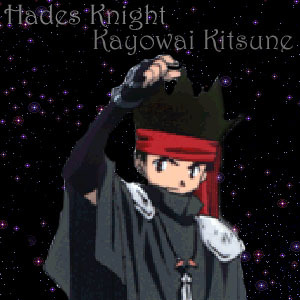 (With the way they both act, they're a match made in heaven.. *snickersnort*) As Hades Knight, he's quite the fighter. He does get out of control... but this -is- Kitsune under there, remember that. Kitsune says this to transform into Hades Knight. Raising his henshin stick, maroon strands of energy flow out and form about him, creating his fuku. Maroon shirt, headpiece, and choker. Forest green pants and black dress shoes. This is Hades Knight's only attack. Raising his hands, a blanket of black, red and purple energy fills the skies, knocking the target unconscious. Kitsune OR Hades Knight says this to transform into Silver Hades Knight. Same tranformation as before, but his headpiece and choker has a silver pendant with his sign on it. This is Silver Hades Knight's only attack. It's kind of like Time Blanket, save that there is a thick fog that comes rolling in. It envelopes the target and distracts them with bad memories. Kitsune OR Silver Hades Knight says this to transform into Golden Hades Knight. Same transformation as before, but he gets a maroon staff with a sphere within the top that's colored forest green and his sign etched in it. This is Golden Hades Knight's defensive attack. Raising his staff, black crystals fill the air and fly at the target, dropping like A-bombs all over the place, the energy within chocking them. This is Golden Hades Knight's offensive attack. Unlike most, this attack does not help the Senshi, it only harms the target. Swirling the staff in the air like you would stir soup, sending out swirls of energy, which reverse the attacks thrown at himself.